Retail - Furniture - Tavares Group Consulting Inc.
Tepperman’s was started by Nate Tepperman in 1925 with door-to-door sales of household goods in Windsor, Ontario. Through two generations, it is now a 91-year-old family-owned home furnishing retailer, serving mainly Southwestern Ontario. 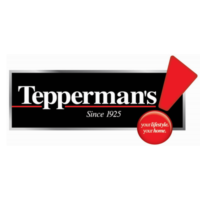 Tepperman’s has five stores across the region located in London, Windsor, Kitchener, Chatham, and Sarnia; with the two largest locations being Windsor and London. Led by Andrew Tepperman, the company is committed to incorporate sustainability through the economic, social, and environmental aspects of the business. In 2010, the London store received the Don Smith Commercial Building Award for the facility’s environmental sensitivity, design, innovation, and the extent to which the new building meets a specific developmental need within the community. Since that time the company has continued its efforts towards sustainability. Most recently, Tepperman’s was recognized through the 2016 annual Environmental Leadership award from the London Chamber of Commerce. Over the years, sustainability has been continually growing at Tepperman’s and it is now a part of the company’s six principles in the 2025 Vision Statement. Tepperman’s has variety of different sustainability initiatives that have been implemented since 2014, including LED retrofitted showrooms, Styrofoam emulsifiers (in Windsor and London location), and Thermoplastic Polyolefin (TPO) membrane rooftops. Through its efforts, the company has achieved an approximately 76% recycling rate of all waste materials. Despite its numerous accomplishments and efforts to promote sustainability within the communities in which it operates. Tepperman’s is working to promote its current initiatives, and plans address social and economic sustainability on top of the environmental aspect of sustainability. In the summer of 2016, Tepperman’s decided to use the Sustainability Toolkit to accurately assess and benchmark their on-going environmental sustainability initiatives, looking especially into their waste management system. A thorough evaluation of the current initiatives was needed in order to assess the efficiency of the previously implemented activities, and to gauge any potential gaps. As a retail company, a large portion of Tepperman’s waste is generated via packaging materials that are composed of plastics, cardboards, Styrofoam, and scrap woods (in furniture). In addition, the company wanted to perform an assessment of the current waste management practices to ensure that recycling was occurring in a responsible manner, materials were properly handled, and waste tracking was properly documented. The Toolkit’s 13-step approach allowed Tepperman’s to perform a gap analysis of their current waste management system and identify the potential actions required to make the current sustainability initiatives more efficient and productive. Based on the results obtained from using the Toolkit, waste tracking documentation was properly created through a partnership with a waste management company, and a recycling policy was developed. A new scrap wood recycling program, enabled the company to divert this waste from landfill, by using turning wood pieces it into a fuel source for greenhouses in the local community. This has allowed Tepperman’s to successfully move from 76% waste diversion rate of all waste materials to 83% diversion rate, and near 100% for packaging materials. Tepperman’s previous sustainability initiatives have focused on the Environment. The Toolkit was used to review the metric stakeholder engagement, within Community, allowing the company to expand is social focus. For Tepperman’s stakeholder engagement was an unfamiliar metric as they have mostly focused on the environmental aspect of sustainability and community development through charitable giving. The Sustainability Toolkit provided Tepperman’s with guidelines to develop processes through which to engage stakeholders. An employee sustainability survey was conducted to better understand the employees’ level of awareness and interest in the company’s sustainability initiatives. The survey served as the initial baseline for stakeholder engagement, and was used to take appropriate next steps. Additionally, in order to further encourage employee engagement, a sustainability board was implemented. The board served not only as a tool to increase the awareness of sustainability within the company, but also as a way for employees to make suggestions to the management and executive teams. As a retail store, customers are an important stakeholder group for Tepperman’s. In order to promote its sustainability initiatives to customers, a sustainability website was developed, where all stakeholders can freely access additional sustainability information. As the next step, Tepperman’s is developing sustainability mailers to provide to customers after delivery. The mailer will help to promote the sustainability website and let the customers know that all of the packaging materials taken back from delivery will be properly recycled. The Sustainability Toolkit from Tavares Group Consulting served to provide Tepperman’s with a tool to perform an initial assessment of the current sustainability initiatives, and effectively identified gaps and areas for improvement. With Tepperman’s, the Toolkit helped to highlight effective, already implemented, sustainability initiatives and provide ways to improve the efficiency.